Diet-to-Go, online at DietToGo.com, offers healthy, low-fat meal plans to help you lose weight. Choose from Diet-to-Go’s 3 menus, including Low-Fat Traditional, Low-Fat Vegetarian, and Low-Carb. Diet-to-Go delivers meals that are prepared by chefs straight to your door for maximum ease. Diet-to-Go uses top quality ingredients and follows the guidelines of all major health organizations, so feel good while eating nutritional, delicious food. Before you dig in, check RetailSteal.com for Diet to Go coupon codes, Diet to Go promos, and Diet-to-Go discounts. Diet-to-Go offers mail order delivery nationwide, and local service to the greater DC, Virginia, Baltimore, Philadelphia, New Jersey, and San Francisco Bay areas. Refunds on paid orders are allowed if received by cut-off times. Check website for full details; exclusions may apply. Get $25 off any order of $100 or more when you use this code at Diet-to-Go. Click link now. Receive a free diet analysis when you sign up at Diet-to-Go. Click link to sign up. 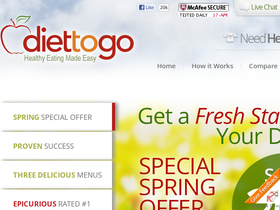 Use this coupon code online at DietToGo.com to get $20 off your first order. Click link now to save. Enjoy free meals for a day with this promo code from Diet To Go. Click link to activate coupon code. Use this coupon code online at DietToGo.com and enjoy a $10 discount on your order. Use our coupon code at Diet-to-Go and save 15% on your entire order. Use this coupon code online at DietToGo.com to get 15% off any meal plan. Click link now. Enjoy 20% on any meal plan from Diet-to-Go with coupon code. Click to start saving. Enjoy a 25% discount from Diet-To-Go when you enter our coupon code at checkout online today.